Our tour starts with a 15 minute walk along a section of the Cape to Cape track to the sea cliffs at Wilyabrup where we have a safety briefing. Challenge yourself and give rock climbing in the rough a go. You’ll be surprised at how easy and fun it is. Break for morning tea (supplied) and then – what goes up must come down. 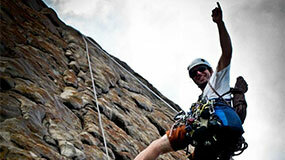 Once you’ve tackled the cliff from the bottom – our experienced guides will help you lower yourself off the top. Cliff heights vary from 10m to 40m depending on skill and confidence levels.